"This is a pecan pie you won't want to forget. 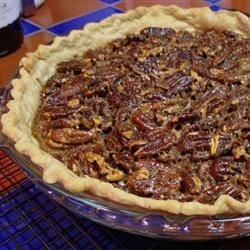 Bourbon gives this pie its delicious and distinctive flavor." Mix the white sugar, brown sugar, and butter together in a bowl. Stir in the corn syrup, eggs, and bourbon; fold in the pecans. Pour the mixture into the pie crust. Bake in the preheated oven for 10 minutes; reduce heat to 350 degrees F (175 degrees C); continue to bake until the pie is set, about 25 minutes more. Allow to cool completely on a wire rack before serving. Great recipe! I did make a few changes, left out the sugars, butter, syrup, eggs, crust, etc.......bourbon was a great help while preparing a huge Thanksgiving dinner. This was okay. I was born and raised in Georgia and ours was much more flavorful. Needs more butter and bourbon taste which I will add the next time I make this pie. This was an excellent pie. Since I had no bourbon, I used Gentleman Jack instead. This is my new Thanksgiving pie. Thanks!